Junior year (I think; maybe senior year) some of 'us' were invited into a group sponsored by some fairly shadowy adults whose apparent interest was in exposing us to radical ideas we might otherwise miss. We'd gather once a month or so at one of the adults' houses, usually to meet an expert guest. The guest would tell us amazing things, we would react and discuss. I remember two evenings in particular: one evening we met with a research associate of Timothy Leary (who was then a psychologist at Harvard) and he told us about these interesting experiments with LSD. He read us stuff written 'under the influence' by participants: criminals, ordinary housewives, Leary himself. No samples were distributed, but there was a lot of thought provoking conversation. I actually think that evening helped prevent me from becoming a drug user as the 60's wore on. The other special evening I remember involved a researcher from MIT who was working on artificial intelligence. This was very early in the 1960's; computers were big and did generally undramatic things (outside of the Defense Department, anyway) and the notion of artificial intelligence as a possibility instead of a fantasy was quite startling. A lot of the conversation devolved into what computers were, and how they worked (as compared to what brains were, and how they worked.) I remember thinking that computers seemed like fairly rational and transparent devices, and that programming them might be fun. I go to college, fall into an Art History major, go to grad school, teach Art History for a while, and finally get a position at a College that goes belly up (ah... the mid - 70's.) I'm unemployed for a while, get into my printing press days, find work as a museum curator, and finally one day just walk away from that job. So I'm working part-time at odd-jobs, being a general house-husband, and in the meantime there have been all these weird Ataris and Apples and Commodores and other 'home computers' that have sprung up. $150 was the price at which I popped; A month later it was $100 and inventories were cleared within the year at $50, but by then I was already spending hours in front of my TV, getting the built-in BASIC to do something new every day. One of my earliest 'real' programs used the tone-generator to play a tune I had written in high school, accompanied by a less than dazzling (I considered it subtle) visual display. Then I started working on this little system to track our meagre household budget, a program which strained my original system to its limits. It got to the point that it took several minutes to load the code and data from the cassette. But I was moving up at the IRS, working more for better pay, and since TI had essentially abandoned the device the price of expansion stuff was falling like Niagara. I got an expansion box with RS232 and parallel ports, a monitor, an Okidata line printer, a couple of diskette drives, and a fancy third-party 'double-sided double-density' controller for the drives. I started using the budget program in earnest. I did my 'creative writing' on the system, eventually finding a third-part word processor called Companion, and I even started to crack TI 9900 assembly language. Within another year I was selling utility programs I had written in assembly language, and I published a small article on an extension to the TI-Forth language. 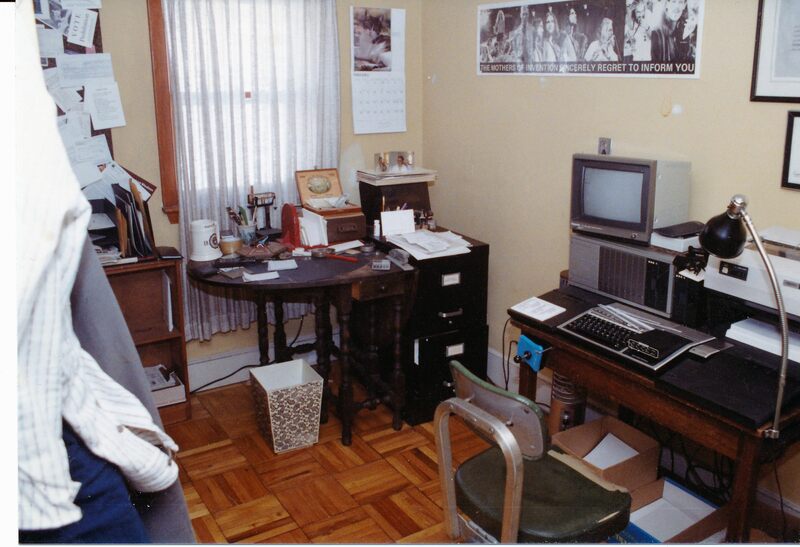 By then I was also working on computers for the IRS: ugly CP/M boxes, networked to a massive 10 Mb hard drive, producing DB2 and Visicalc stats for the call center. 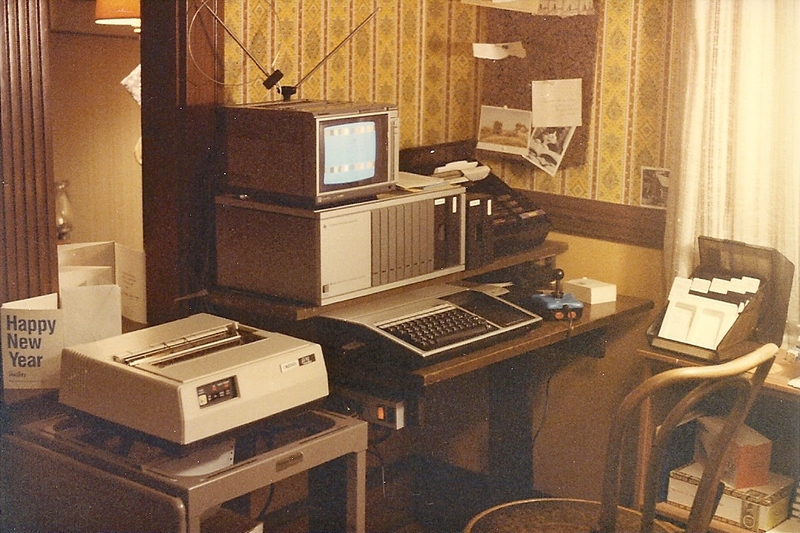 But I heard about this better spreadsheet called 1-2-3, and suggested that the IRS buy one of these IBM PCs (so I could learn it, actually) and within a year I had bought my own: an XT clone with a Hercules mono video system that cost $2000. [It seems like all my subsequent PCs cost about $2K as well...] I transferred the budget data, the poetry and the correspondence stored on the TI over to the PC (via null-modem serial connection, no less) and then I sold the whole TI kaboodle to some kid in San Francisco. I think I got $450 for it. I had also retained a collection of 5 1/4" floppies with my old TI code on them, and I figured there might be 'interesting' stuff on them as well. And it turns out there's lots of TI-99 related equipment available on eBay. The first system component I tried to buy was a complete expansion box with a hod-rod disk controller, very much like my old system. I lost out on that one to a more aggressive bidder, but I soon got the price ranges right, and piece by piece the system has been reborn, and then born again, and again. If you're interested in the details, see this page. As I assembled the hardware and started poking around in my old floppies, the first thing I discovered was that I had forgotten how to use any of it! I don't just mean that I had forgotten the odd BASIC command or assembly syntax, I mean forgotten the most elementary stuff: how to load a program, for example, or how to print properly. I didn't even know what was on some of the diskettes I owned, and had to re-discover the old CATALOG program to see the listings. Even when I was able to find some of my old assembly language utility routines, I still couldn't figure out how to load and run them. Some of the simpler programs seemed like just BASIC code but wouldn't run. Sometimes this was due to hardware compatibility issues, sometimes because they employed exotic loaders and hidden code, and other times they had unknown dependencies to other software support routines that, back in the day, I had taken for granted. But I knew I had figured all this stuff out once, so I knew I could do it again. Naturally, geek that I am, I have looked to the internet for guidance with my TI reconstructions. There are more dead TI sites than live ones, unfortunately, and most of them focus on the one or two popular TI emulators which are available for the PC. For my take on the emulators, see this page. There's also a small community who play around with the very late third-party extensions the old TI, including an expansion add-on which created a whole new system called the Geneve™, which was (almost) DOS-like. There is a fairly active mailing list that lives as a Yahoo group, and I lurk there quite a bit. Back in the day our TI's could use a modem (the original TI modem was an acoustic coupler!) and there used to be a lot of good TI-oriented dial-up bulletin board systems around, but this is the 21st century, and dial-up bulletin boards are almost all toast. Internet is everything. Alas, there never was or will be any ethernet for the TI so there's no real internet connectivity available for the original box. Doesn't really matter, since we all have PCs (or MACs) these days. In any event, there are reasons for wanting to transfer data and text between a PC and an old TI-99/4a system, including document recovery and (even) grabbing material for web pages like this one. Without a true networking option, the TI99 - PC connection today boils down to two major options. First there's the same method I used when I bought my first XT: cable them together (or use dial-up a connection) and transfer stuff, mostly text. The original TI terminal emulator used a proprietary file-transfer system, so to talk to a PC you need to have one of the later third-party emulator programs on your TI system which use more open protocols like Xmodem. Otherwise you are limited to text captures, but text transfers are actually very easy, and I still use this method today for capturing text output and documentation. If you do attempt file transfers, you have to be aware that in the heyday of on-line BBS activity, a custom header format was devised to translate the TI file characteristics on the PC side and a customized Xmodem protocol instituted on the TI side which supported adding and stripping that header as appropriate. Without the header, the TI doesn't know how to handle any files it manages to receive. The second method of communication with a 'modern' PC involves PC files which are images of TI diskettes. There are a couple of competing formats, but each essentially creates a binary file that simulates the sector-by-sector structure of a TI diskette. The TI diskettes themselves do not follow PC diskette conventions for sector size or position. There are, however, specialized PC programs which can read and even write to a TI diskette. The best of these is TI99-PC, a complex BASIC program written by Paolo Bagnaresi whose secret key is a small .com program that is called to provide direct hardware-based sector access. It only runs on DOS or older Windows versions, the ones which still allow direct hardware access. Once you have binary images of TI diskettes, there are lots of ways to read them if you know the proprietary diskette/file structure. I have even written a Windows package of my own which can view and format individual files, as well as extract them, as long as the disk image is in the so-called V9T9 format, the simplest and most common of the binary formats. I say to anyone who asks that you can't really do anything productive with an old TI-99/4a system, especially given the communications limitations and cumbersome (and usually proprietary) disk I/O. You can type on it, but the document you produce is hard to share. You might be able to cook up a database, but the data will not be portable. And modern client software, from browsers to SQL clients, are completely out of the question. So why bother? I made this effort for the sake of the effort itself. I did find some old code, old games I had written, old utilities that I devised; but it's not that I want to use them, or even play the games. I just enjoy having them. They are my past, part of my personal history that is now that much richer and more real because I have access to these tangible bits (and bytes.) It's not pride so much as a sense of completeness. And I have to add, the old boxes and devices are so cranky and weird, making it all work again is so challenging, that it's just good, honest, frustrating-make-you-scream fun. Keeps the old brain cells busy. And that counts for something. As of this writing these links are valid and may even be useful or interesting to you. http://www.ti99ers.org/ The OLUG. Not the host of the active mailing list. http://www.planet-99.net/ Home of the 'Landmark programs' list. http://www.mainbyte.com/ti99/ An excellent technical site full of how-to's and other information. Good-looking and well maintained. The Home Page of Dan O'Quinn an excellent site for information in disk drives and cables, including the pin-outs for the elusive Okidata-TI cable. http://www.nouspikel.com/ti99/titech.htm A direct URL to the TI tech pages, a great site, but highly technical. The Tom Gaskill TI Timeline , updated. Even mentions me on the 1984 page! http://www.oldcomputers.net/ti994a.html Includes an interesting picture of a complete "side-car" setup. http://perso.club-internet.fr/pytheas/english/TI99.html Raphaël Nabet's TI pages in English. Some interesting stories, a very nice site. http://pw1.netcom.com/~mjmw/ PC99 - Sometimes classed as the best emulator; not free, but uses licensed ROMS etc. Neither the site nor the emulator has been updated for a while, but I understand the emulator as well as the author's amazing CD ROM of scanned and formatted TI -related documents called The Cyc is still for sale. http://www.shop.texintreasures.com/ is Mike Dudeck's site. Mike purchased the remaining inventory of Joy Electronics and is a source of new and used TI equipment. Yes, you can go to The FAB TI-99/4a Download/Article Pages to download bits of my old code, articles, and even whole diskette images of useful(?) material. Document maintained at the Fine-Arts Bluesband, © 2008. Direct comments to rgm at fabbnet.net.